HomeCYCLINGCyclo Sportive welcomes young cyclists and a couple of ‘Boris’ bikes! Cyclo Sportive welcomes young cyclists and a couple of ‘Boris’ bikes! 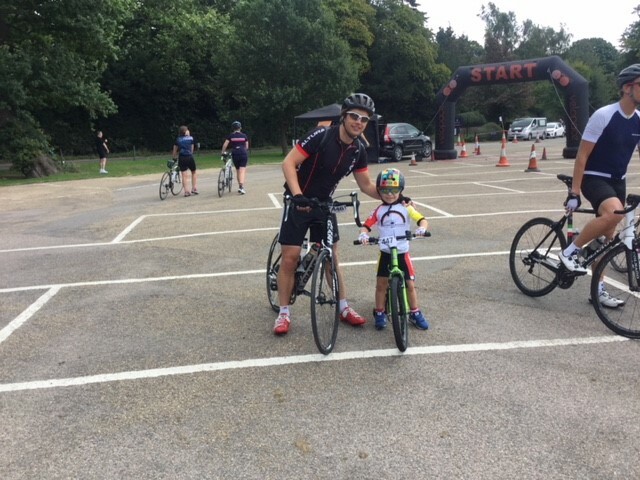 450 people gathered to take part in the 21st annual Circuit Of Kent Cyclo Sportive on Sunday, including a seven year old boy and an eight year old girl. The event is a challenge cycle ride which is organised by Sevenoaks Amherst Rotary Club and got underway in near perfect weather conditions. With a choice of 40kms, 80kms and 130kms riders are given a time based on their age and gender, and can go for a gold, silver or bronze standard time. All riders are given an electronically operated tag to wear and their times are recorded as they pass under the finish banner. However, it is not a race and entrants have the choice of riding as slow or as fast as they wish. The 40km route which was introduced in 2016, has proven popular with young families and amateur cyclists. It runs from Sevenoaks Prep School through Plaxtol to East Peckham and back past Shipbourne. This shorter route is intended for families accompanying children as long as they are competent to ride on the road, have a helmet and suitable bicycle. The route is challenging and includes the infamous Carter’s Hill, so is not really recommended for those under 12 years old. 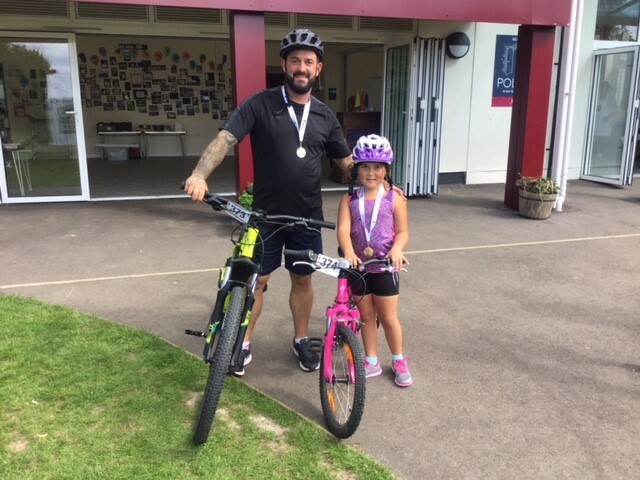 However, Florence Vella, aged eight, and her father Ben from Dartford plus Derek Bleeker and his son Johannes, seven years old, from Sevenoaks both took on the challenge and completed it whilst having fun with their dads. Meanwhile, Gary Donald and James Woodford from New Eltham arrived on their specially adapted wheelchair bikes. Each bike has 32 gears and they both cycled the 40km course. 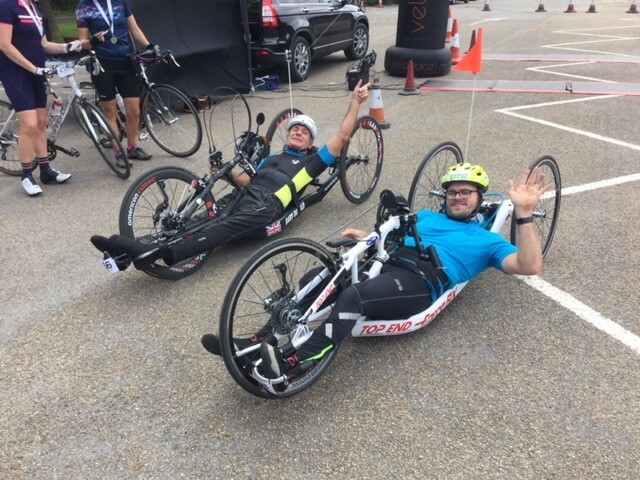 Gary and James started The London Wheelchair Triathlon Club earlier this year. It’s a club centred around the Queen Elizabeth Olympic Park in East London and is looking for wheelchair members to take part in distance (endurance) events using a race chair, handcycle or swimming, or any combination for duathlons and triathlons. 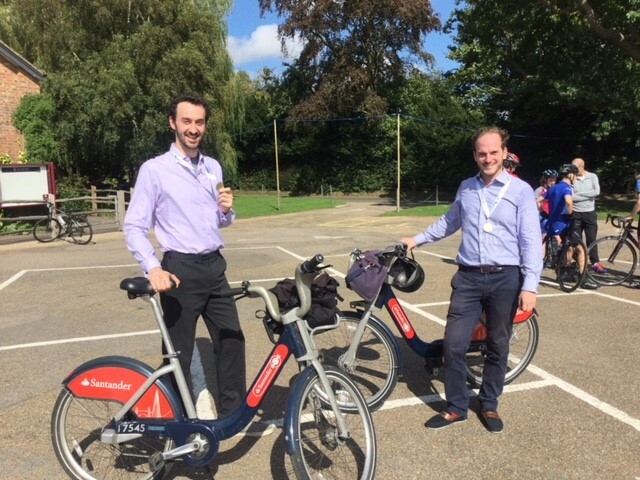 Lastly, but by no means least, friends Andrew McMillan and Joseph McLean who live and work in London decided to take a different approach to the Cyclo event. They hired Boris Bike’s for the day at London Bridge, then caught the train to Sevenoaks. They cycled up to the start at Sevenoaks Prep School and then completed the 40km course before enjoying the lunch provided by the organisers. They then cycled back to the station, caught the train back to London and returned their bikes to the stands. Hire of bike for the day £50. They even cycled up Carters Hill and you can see in the photo that their challenge was not only cycling with a bike that is somewhat heavy and has only three gears but they decided to do it wearing business clothes as well. Each year this non-profit event raises thousands of pounds for charity including Hospice in the Weald and MacMillan Cancer Support. To find out more about the event, please visit their website at kentcyclosportive.co.uk. Sevenoaks Sports’ September issue is out this week!